Remember to renew your membership before the event for faster check in! You can check your membership status online or on the HoMA App. Non-members: General admission is $30. You can purchase tickets at the event, or online using the button below. 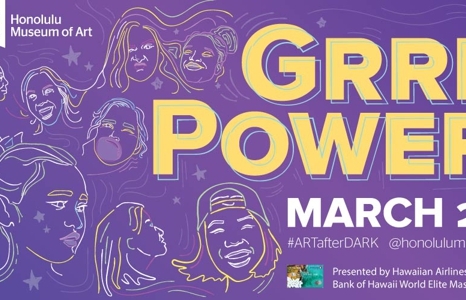 Or for just $10 more you can join or renew a membership to get into ARTafterDARK for free all year. Win 80k Hawaiian Miles from Hawaiian Airlines® Bank of Hawaii World Elite® Mastercard! Visit their table in Central Courtyard to enter. DJ Yooey Kim lays down GRRL power anthems in Central Courtyard from 6-7:30pm. Michelle Harada creates dreamy collages and vibrant works on paper in the Café until 8pm. Let your inner goddess do the dancing when Shakti Dance Movement Center performs in Central Courtyard at 7:40pm. Share words of empowerment with Rush Wahine photo activity in Palm Courtyard. End the night on the right foot, The Good Foot! Playing in Central Courtyard at 8pm. Food provided by EAT Honolulu. See the menu. Beer, wine, and a specialty cocktail—Flora Fatale with prosecco, St. Germain and soda—by Free Spirits Mobile Bartenders. Don't get lost! Find all the food, drinks, art and entertainment on this handy museum map. • Lot behind the Honolulu Museum of Art School (1111 Victoria St), enter from Beretania or Young Street. Lot closes promptly at 11pm.